Most businesses have a view of how many visitors they get to their website each month. But the view can be muddied. If, for example, you only provide products or services within your home country, then any visitors from outside your country should be considered as irrelevant and deducted from your total visitors numbers. However, if you DO provide products or services outside your home country then the statistics can uncover opportunities to better capitalise on those visitors. To view the countries that have visited your website, first select a date range (typically a month but it can be more useful if a longer time period). 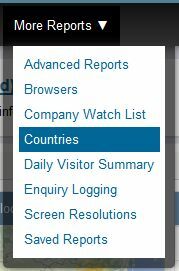 Then select ‘Countries’ from ‘More Reports’ within the main navigation bar of A1WebStats. The view you see below shows that the company has nearly 78% of their visitors from the UK. That’s 1,294 out of the total 1,661 visitors they had in that time period. Because that company doesn’t supply to outside the UK, it can immediately knock off all those visitors from outside the UK, leaving it with a potential buyers base of 1,294 for the month, instead of the overall 1,661. What they could then do is use ‘Advanced Reports’ within ‘More Reports’ to identify all those visitors from the UK who got as far as any of their products pages. That took the number down from 1,294 to 1,040 who were feasibly interested in specific products. From there they could drill down further to get more insights into those visitors. For example, drilling further down to those UK visitors interested in products and who got as far as their hire locations, which takes the number down to 106 and gets themselves asking the question “if so many people were interested in the products, then why did so few get to look at where we hire the products out from?”. This then leads onto website strengthening activities. Now let’s look at the situation of a business that does offer their products or services outside their home country. We would like to sell more to other countries so are wondering why we don’t get more enquiries from those countries? Expand your date range (e.g. to 3 months). Export the countries data to Excel. Compare the number of visitors from each country to the number of enquiries gained from those countries. Express the difference as a percentage in a new column within Excel. Next identify the countries that you’d like to be gaining more enquiries from. I can see you’re in the UK. Although I can dig deeper into the products/services you offer, I’m initially more interested in whether you can serve me in my country, and that you have some evidence that you’ve done so in the past. If you can’t demonstrate to me that you can serve businesses in my country, then why should I consider you instead of a business that is closer to me/speaks my language? Picture the visitor (from another country) that is visiting your website. Whatever pages they land on, or go to, they will still be thinking “show me that you can serve businesses in my country”. A general summary of the types of businesses that you have served in various geographical locations. b) A country (e.g. Germany). Clearly, option 2 above is going to be stronger, and within that, option b will have more impact. They land on the website. They may look at various product/services pages. They will certainly look at your geographical location. They will see, on various pages they move through, that there is a map (could be Europe, could be the World), and a link encouraging them to click through. They get to a page (e.g. about the Europe focus). They see that there’s a link/graphic to a ‘Germany’ page and they click on it. Within that Germany page they see several examples (ideally, including testimonials) of Germany customers who have bought from the business. They make contact with the business in the knowledge that the business has served businesses within their own (Germany) geographical location. Why don’t more websites apply this focus? Being unaware that they have traffic from those locations and are missing out on opportunities. Not having the time/resources to implement the international focus. 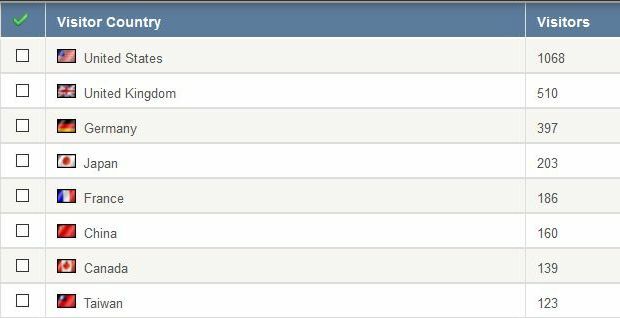 Once point 1 above is addressed, point 2 can be worked towards by setting up A1WebStats automated reports that show visitors from certain countries, and what they looked at page by page. When you’ve had a few days or weeks of seeing that data, the drip-fed nagging of “it’s time to impress these overseas visitors!” can be the catalyst to make the website changes that will benefit your business.